This is asfar from local food as you can get. I had a craving for sea food in general andgrilled seafood in particular so what do you do if you live in South-WesternOntario, Canada, thousand miles away from nearest ocean or sea? Whatever isbilled as “fresh fish” in our supermarkets and is from salt water is only relativelyfresh if you get it when it is delivered. Fat chance of that on most days, Ithink. The closest to “fresh fish” inland and far away from ocean is fishfrozen right on factory fishing trawler. Among the choices I had in larger town40 minutes away were sardines and mackerel. What I came up with for a meal tosatisfy my cravings was a fusion of Portuguese and Japanese favorite snackfoods: grilled sardines rubbed with a bit of olive oil, salt and pepper andmackerel marinated in teriyaki sauce. Only after we ate our fill did we realizehow full of Omega3 fat these fish were. This is not a main meal food, no sir. Ihave made a mistake right there. I knew that just 2 sardines or half a mackerelwith crusty bread would be enough for one serving but I felt that since I havethe grill going I’ll cook some more. And so I did. If usingfrozen fish, defrost in refrigerator overnight. When readyto cook, rub the grill with little vegetable oil (so fish won’t stick) and preheatyour grill or BBQ on medium high. To clean the sardines and prepare it for a grill, make a cutalong the bottom of the fish and remove the intestines and entrails (simply runyour finger inside the cut). Do not remove the head. Rinse and place the fishaside to dry. Rub the fish with little bit of olive oil and season withkosher salt and freshly ground black pepper. To prepare mackerel, cut along the bottom from tail andacross the head almost all the way through and then cut in half across betweenhead and tail. Remove head and tail. The fish will be basically “butterflied”. Washand dry on both sides. Watchthis video for clear and detailed instructions. Rub little bit of sesame oil and teriyaki sauce into fleshor just use olive oil, salt and pepper. 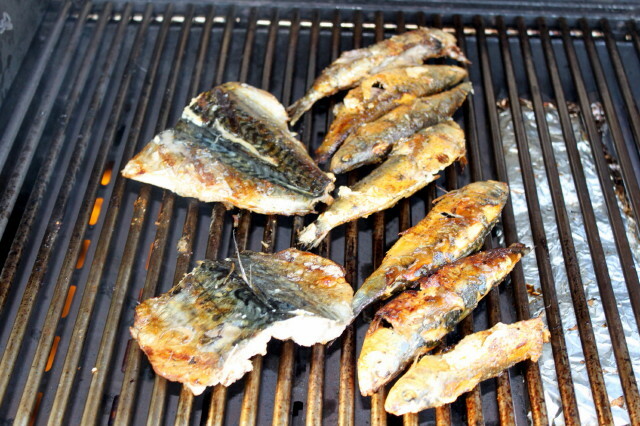 When grill is hot place sardines and mackerel(skin side down) on the grill and cook till skin is crisp and golden, 4 -5minutes. Flip the fish over and grill till other side is crisp. Serve with a wedge of lemon and crusty Italian or Portuguesebread. To de-bone sardines, grasp the head and pull towards tail,the backbone will come off cleanly. Mackerel backbone and rib cage will comeoff easily as well.